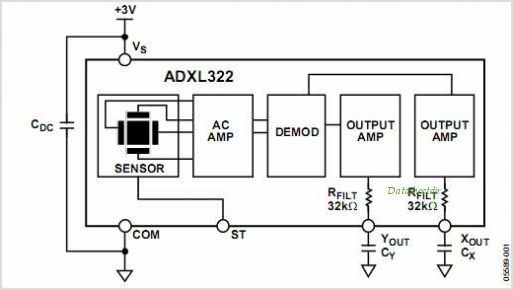 The ADXL322 is an ultra small package (4 x 4 x 1.45 mm LFCSP) and low power (340 A at Vs = 2.4V) 2g iMEMS Accelerometer designed to accommodate the integration requirements of mobile phones and other portable devices for a variety of motion, tilt, and inertial sensing features (e.g., data entry, menu and Display control, Power Management situational awareness, navigation, and portrait vs. landscape Display orientation). The ADXL322 also enables hard disk drive protection systems and security features in notebook computers, as well as position and tilt sensing for PC and gaming peripherals such as mouse and joystick devices. This is one package pinout of ADXL322,If you need more pinouts please download ADXL322's pdf datasheet. 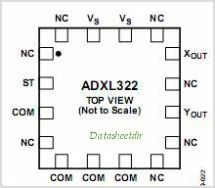 This is one application circuit of ADXL322,If you need more circuits,please download ADXL322's pdf datasheet.